Le Vieux Port provides a camping holiday that will never be forgotten. Combining a massive selection of pitches with a variety of leisure activities, this luxury camping site will suit the needs of an entire family. You can learn more by contacting LUX-camp directly. A choice of either a mobile home or a tent. Direct access to the shores of the Mediterranean. A selection of gourmet restaurants. Children and adults can experience endless hours of aquatic fun at this luxury camping site. Le Vieux Port boasts no less than 1,400 square metres of outdoor swimming opportunities. There is a large wave pool for the younger generation, a heated spa and a lagoon-themed pool. 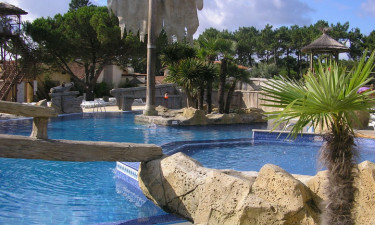 The largest swimming area is surrounded by sand and tropical palm trees. While the beach is close by, many families will simply choose to enjoy the splendour found within the confines of this luxury camping resort. While the aquatic attractions are indeed impressive, there are many other activities that families can select. Table tennis, tennis and bicycle hire can all be found within the site itself. 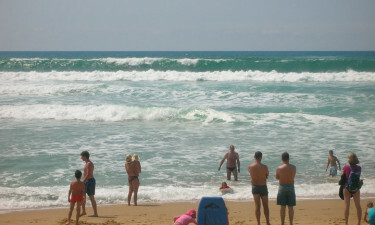 Other options such as sailing, surfing and golf are located only a short distance from Le Vieux Port. Camping luxury has never been more exciting! Le Vieux Port has placed a great deal of effort into ensuring that all of its guests are comfortable during their stay. This luxury camping site provides amenities such as wireless Internet, food provision facilities, restaurants and sanitary areas that can all be accessed by those with wheelchairs. Washing machines and tumble dryers are also available for every patron. Le Vieux Port offers three very unique restaurants to choose from. Breakfast, lunch and dinner are all served while there is a takeaway menu available. Some of the delicacies to be experienced include minced beef, fish, fresh vegetables, foie gras and countless other temptations. Some locations offer a "gourmet discovery" option that is intended to introduce customers to the many regional specialities cooked here. Families with children will be pleased to know that dishes can be specifically prepared for young ones. Each restaurant has its own bar; ideal for a tasty drink or a nightcap before heading back to the mobile home. 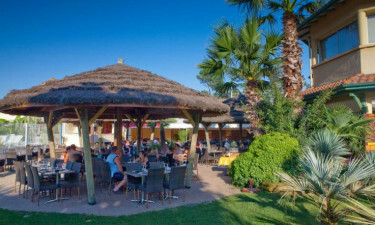 The holiday camping site of Le Vieux Port provides a fully equipped SPAR supermarket. This is a brand famous throughout France and other parts of Europe. It is open every day throughout the season and this massive centre will offer everything that guests may require during their stay. Alongside foods and drinks, the supermarket offers postcards, frozen products, sanitary items, international newspapers and cigarettes. Those who are interested in learning more about this amazing luxury camping site should always contact LUX-camp at their convenience.